Are you feeling desperate – overwhelmed, anxious, in physical and emotional pain, like you just can’t go on? Perhaps you are hearing voices, seeing things that aren’t there, feeling alone and scared. Perhaps you can’t slow down or stop doing things you don’t want to do. Maybe something really bad has happened to you or to someone you care about. You may feel like there is no one to turn to for assistance and support. This feels absolutely awful. I have felt like this many times in my life. It is horrid. The pain for me is greater than any physical pain I have ever experienced. I learned, from other people that have had similar experiences, that there are things I can do, right now, to help myself. The actions below are a list of ideas. They won’t all work for you, but some of them might. Choose the ones are available to you and that you feel have the best chance of working and then do them. It may be hard to do them so you will have to push yourself. You will probably be able to think of more things to add to your list. 1. Go to a peer support or peer respite center and tell someone who understands how you feel. You may have to have had a prior relationship with the center to make this happen. If you are feeling OK right now, you may want to check on that. You can find out about peer respite centers in your area by calling your local mental health center. 2. Contact a supporter–the person in the world who treats you best. It might be your spouse, another family member, or a friend, or a peer, or a co-worker, or even someone you just met. Then tell that person how you are feeling. Ask them to just listen and not give you any advice. Tell them if they will listen long enough, you may figure things out for yourself. Tell them if they will do this for you, it would be a great gift. I know people who have done this around the clock, changing listeners as needed, for as long as it took for them to feel better. This is the kind of thing you can set up for yourself when you are feeling well. 3. Stay away from anyone who treats you badly. Reach out to agencies, even the police, in your area for help to keep this person away from you if necessary. 4. If you are in a support group, go to a support group meeting. 5. Do something you really love to do to divert your attention for as long as it takes–make music, whittle, draw, write, sew, pet your dog or cat, watch a good movie, listen to good music, play with a child, etc. 6. Eat some comfort food-whatever that is for you–ice cream, macaroni and cheese, a brownie sundae, a big salad, a hamburger, chips. 7. Do relaxation exercises or listen to a relaxation CD. Do yoga or meditation. Stare at something beautiful. Read a poem or passage in a book that is meaningful to you. Whatever helps you relax. 8. Get some exercise. Whatever you can do for as long as you can do it. 10. 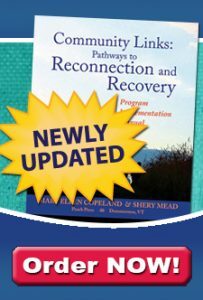 If you have a Wellness Recovery Action Plan, follow the “When Things are Breaking Down” action plan until you are feeling better. 11. Contact your counselor, doctor or other health care provider. Set up an appointment or ask them to see or talk to you right away. 12. You may decide you cannot get through this on your own. Then you can call emergency services. If you end up in the emergency room at the hospital or in some other facility, ask to have a peer supporter or the family member of your choice with you. After you are feeling better, develop a Wellness Recovery Action Plan for yourself to help prevent a recurrence of this very hard time, or so that you will know exactly what works for you the next time it happens. For more information on WRAP and WRAP resources, go to the WRAP Info Center of this website. Click Here for a long list from people who responded to a Facebook post asking what they do when things are really hard for them.